The most innovative, technologically advanced pressure grouting, chemical grouting, underpinning and other foundation services for your total sinkhole remediation and repair with a keen eye to top quality workmanship and service. Putting your foundation back on solid ground with underpinning, grouting, soil stabilization and quality restoration from the underground up. Find out more about these foundation repair options, and why we use the industry’s #1 standard for steel piering systems and helical torque anchors. The leading manufacturer of steel foundation repair, basement waterproofing and guy wire anchor products in the industry for homeowners, ECP’s select network of top quality foundation repair contractors, electric utilities, the engineering community and for new construction. ECP makes the strongest resistance piers and helical piles, with premier quality control, customer service and precision customization. The premier poly grout professionals for soil stabilization for residential, commercial, infrastructure and sea wall applications. Specialties include polyurethane injection that’s strong, inert, clean, quiet and fast, concrete slab raising, zero excavation infrastructure repair, infrastructure chemical grouting, abandoned pipe grouting, StableSoils Soil Binder, structural chemical grouting and extensive sea wall applications. 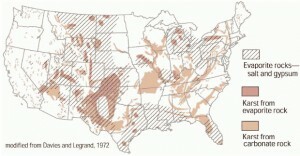 More on www.StableSoils.com. What you need to know about sinkholes in Florida, karst terrain, what accelerates sinkhole formation, how to know if a sinkhole is developing, and myriad questions about sinkhole formation, insurance, repair. Frequently asked questions about the foundation repair process and materials, the signs of foundation failure and sinkhole damage, underpinning and grouting, cosmetic repairs, home resale value, warranties and more. The industry’s first and only 10-year transferable warranty for Florida foundation stabilization projects, giving you the most comprehensive warranty coverage in the industry. Offered through America’s largest warranty coverage, it’s the first to be guaranteed by an A+ rated global insurer in A.M. Best’s highest financial size category…and it’s free to the homeowner. Sinkhole and foundation repair companies are not created equal. So here’s a list of questions to ask each repair company bidding for your business, questions about references, association memberships, experience levels, the handling of disruptions and unexpected situations, the products and equipment used, etc. Florida Association of Sinkhole Stabilization Specialists (FAS3) — Florida’s premier association of engineers, geologists and contractors concerned with the planning, design and construction of subsurface grouting and foundation stabilization. You should only use a sinkhole and foundation repair specialist who has qualified to be a member of FAS3. Learn about foundation repair products like helical piers, steel piers and plate anchors, and read about what you need to look for if you suspect there are problems with your home’s foundation. Foundation repair articles explain your repair choices. An ethical marketplace which rates businesses, sets standards for marketplace trust, encourages best practices, and denounces substandard marketplace behavior. You should always check out a contractor with your local BBB and read any complaints before making your selection. Foundation Services of Central Florida, Inc. has an A+ rating from the BBB of Central Florida. A web resource for homeowners who are looking for a professional engineer who will guide them through the process of foundation repair. The Marion County Building Industry Association (MCBIA) is a professional not-for-profit trade organization dedicated to the betterment of the construction industry and the community. “The Voice of the Building Industry,” the National Association of Home Builders (NAHB) is a trade association that helps promote the policies that make housing a national priority. H.W. Barrineau & Associates, Inc.
An engineering and consulting services firm located in Ocala, Florida, H.W. Barrineau also has expertise in the areas of soil stabilization and sinkholes. The Foundation Repair Association, Inc.
A professional national organization that exists to promote high ethical standards in the practice of foundation repair and to promote cooperation between the foundation repair industry and government. Florida Department of Environmental Protection Northeast District Office (904) 807-3300 http://www.dep.state.fl.us/secretary/dist/nedist.htm (for sinkhole-related environmental resource permits in the northern peninsula). 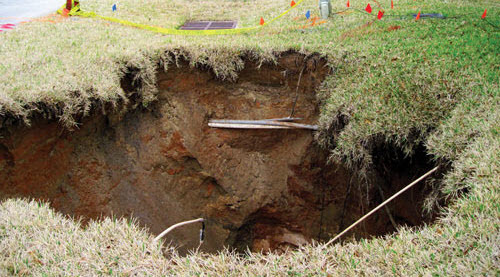 “Sinkholes are common features of Florida’s landscape. They are only one of many kinds of karst landforms, which include caves, disappearing streams, springs, and underground drainage systems, all of which occur in Florida…. Suggested reading: Lane, Ed, 1986, Karst in Florida: Florida Geological Survey Special Publication 29, 100 p.
Frequently asked questions about sinkhole and other miscellaneous questions and answers. Also contains: Florida County Emergency Management websites, Florida Municipal Emergency Management Agencies.